The German foreign minister arrives in Tbilisi today for a two-day diplomatic drive to reach some measure of peace in the country’s separatist conflict zones. 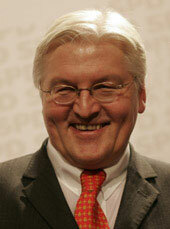 Frank-Walter Steinmeier will meet the Georgian president and other top leaders in Tbilisi, as well as opposition politicians. From the capital he will go to Sokhumi, the de facto capital of breakaway Abkhazia, to meet Abkhaz separatist leadership before flying to Moscow. “The goal of the visit is to continue consultations with Georgian and de facto Abkhazian officials for searching for new ways of peacefully solving the conflict on the background of the tense situation in the conflict region,” said a statement from the German Embassy in Tbilisi. As coordinator of the UN secretary-general’s Group of Friends of Georgia, Germany pays “special attention” to the Abkhazia conflict, the embassy said. The Berlin-backed three-stage plan for conflict resolution is sure to be on the agenda, says Georgian political analyst Ramaz Sakvarelidze. Steinmeier, the German foreign minister, presented the plan to a UN delegation in Berlin two weeks ago, reports the German newspaper Der Spiegel. The full details of the plan are not public, but reports from Der Spiegel and the Georgian government say it includes provisions for rehabilitation work in the conflict zone, the return of refugees and eventual consideration of Abkhazia’s political status. The plan also, according to Tbilisi, asks Russia to reverse its decision to bolster links with the separatist regimes, a move Georgia says undermines the peace process and violated Georgian sovereignty. “The plan includes some details that may be unacceptable for Georgian side too,” says Sakvarelidze. He predicted few concrete results from Steinmeier’s visit to Abkhazia, but said it is “very positive” to see Germany take a leading role as mediator in Georgia’s conflicts. The German and Russian foreign ministers held a phone conversation this week at Berlin’s initiative, according to the Russian Foreign Ministry. “The Russian side underlined [in the phone conversation] that the signing of an agreement on the non-use of force and withdrawing Georgian armed forces from the upper part of Kodori Gorge [in Abkhazia] are necessary for the de-escalation of the situation in the conflict zone,” a Russian statement read.